Based on the same foundation of high reliability, ease of use and leading-edge functionality that has positioned SAILOR as the leading product in maritime communications, the SAILOR 6300 MF/HF DSC Class A offers much more than just a way to meet mandatory GMDSS requirements. In addition to being part of the innovative SAILOR 6000 GMDSS series, it is an integral part of a vessels communication system and a crucial tool when in distress and rugged, reliable, easy to use communications are a must. 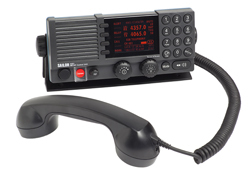 The SAILOR 6300 MF/HF provides several unique new features such as message replay functionality – a first for MF/HF radios, and the ability to connect two control units. A highly efficient power amplifier with control hardware ensures high performance and reliable communication in the marine bands from 1.6 to 30 MHz in TX mode, and ensures constant and full output power on all ITU channels. Instead of connecting the SAILOR 6300 MF/HF to an external GPS, the GPS input can be taken from the SAILOR 6110 mini-C GMDSS via Thrane. Therefore, no additional cabling is needed. The new SAILOR 6300 MF/HF is a high-end communications system in its own right. It complies with the requirement for MF/HF DSC Class A, which is part of the mandatory requirements for SOLAS vessels in all sea areas, and many national GMDSS requirements. It is developed and designed to meet the needs of professional mariners ensuring clear and powerful communication for a wide variety of vessels including high seas fishing vessels, merchant/offshore ships and workboats. information, please do not hesitate to contact us directly!